"It's hard to argue with the notion that Amy Lin gets more press coverage than any other artist in the greater Metro area." That's the beginning of a most excellent review by Kevin Mellema of the Amy Lin show currently at Addison Ripley in Georgetown. Read the whole review here. Mellema is right, Lin has received tons of press and critical attention in her past and current exhibitions. It's also hard to argue with the puzzling fact that so far the Washington Post's Jessica Dawson, whose job is to write about DC area galleries, is one of the rare important critical voices who has so far managed to avoid writing anything about this artist. Lin has managed to capture the attention of nearly every art critic and writer in the region but Dawson's. Says something about having a "finger on the pulse of the DC art scene" doesn't it? I really hope that Dawson proves me wrong and plans to review this current Lin show and bring one of the District's top visual arts voices to the attention of the WaPo's readers. On the other hand, me bitching about Jessica's review choices (or lack thereof) could result in a permanent poisoning of the well and guarantee that Dawson will black list Lin forever. Still on yet another hand, in 100 years no one will know who Jessica Dawson was, but Amy Lin's artworks will still be around and being enjoyed for centuries to come. a pop-up project has it s grand opening tonight and hosts the first of many pop-up group exhibitions, lectures and events at venues throughout the DC area. 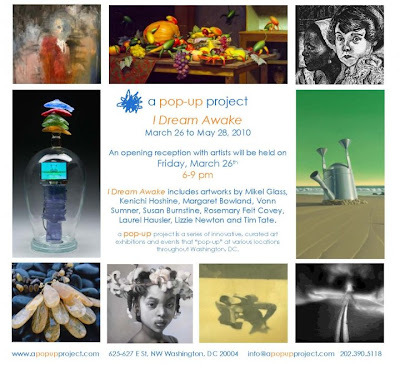 For its inaugural exhibition a pop-up project will open I Dream Awake from March 18 to May 28, 2010 in the former Numark Gallery space located in Penn Quarter at 625-627 E St NW. I Dream Awake is a curated selection of works that presents original artist expressions which explore the link between awakened realities and unconscious dreams. The exhibition includes artwork in various media by New York artists, Mikel Glass, Kenichi Hoshine and Margaret Bowland; Los Angeles artists Vonn Sumner and Susan Burnstine; and local artists Rosemary Feit Covey, Laurel Hausler, Lizzie Newton and Tim Tate. The formal opening reception with the artists in attendance is tonight, Friday, March 26th from 6 - 9pm. Wanna go to a couple of openings in DC tomorrow? Start at Irvine Contemporary, who has a couple of favorites of mine opening: Susan Jamison: Swallowtail: New Paintings and Susana Raab: American Vernacular: Photographs. Opening reception with the artists: Saturday, March 27, 6:00-8:00PM. Then head to U Street, where Katherine Mann, Christian Benefiel and Michael Sirvet also open on Saturday, March 27, from 7-9 PM at Hamiltonian Gallery.